Highly qualified, giving lessons in Seattle since 1986. Musicians of every age and interest are welcome to call and find out about guitar lessons including electric bass, and drum lessons. I have given lessons for nearly all of my musical career and have developed a simple and effective method for improving the player’s technique and expanding the repertoire. 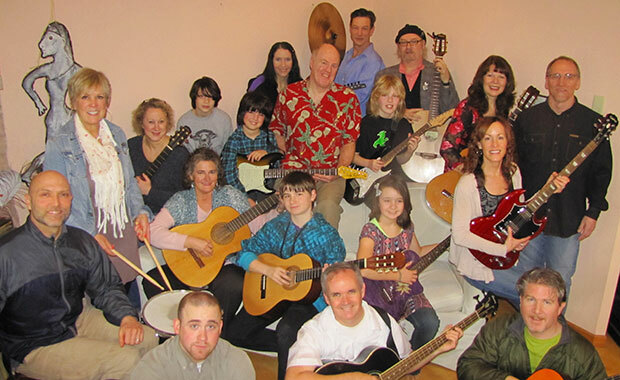 I enjoy working with kids and adults and have had players combine lessons, for example mother or father with son or daughter, or similar level musicians playing together (such as a group of three women, two on guitar and one drumming). In the near future I will have my recording studio available for students who wish to record music. I invite you to check the tab for Musical Information, including video links to playing styles for the guitar. Here I’ve shared some of the basic concepts upon which we build our musical performing. I have studied with master teachers both in public university and private studios, and I hope to share my knowledge and love of music with you, as you pursue your musical side.